For over 150 years, The Salvation Army has represented hope to millions of people in need worldwide. Through its community centers and a network of volunteers, The Salvation Army is on the front line each and every day in nearly every zip code across the United States- feeding the hungry, providing shelter for the homeless, emergency disaster relief, addressing poverty with a myriad of social services, and offering congregational life, educational and wellness programs for our youth and seniors. When you give to The Salvation Army, your donation stays in your community, transforming the lives of your neighbors in need. For The Salvation Army in the United States, it all began in Philadelphia in 1879. That's when 17 year old Eliza Shirley conducted The Salvation Army's first meeting in Philadelphia. 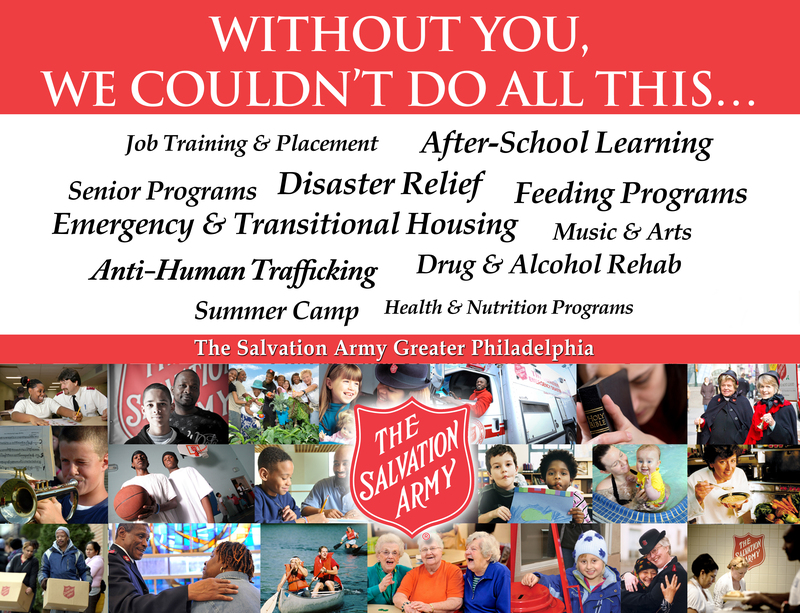 Today, The Salvation Army continues to serve Philadelphia and its surrounding communities with programs and services designed to meet the unique and ever increasing needs of the communities we serve. The Salvation Army is equipped to respond to both acute disasters, such as fires and floods as well as the daily, ongoing struggles of the region’s less fortunate individuals. Ever since its early beginnings, The Salvation Army has consistently maintained a record of success stemming from its holistic approach to providing for the needs of the whole individual – physically, emotionally, economically and spiritually. Our programming operates community centers and residential facilities throughout the Philadelphia region, offering shelter, hot meals, counseling, early childhood development, recreational opportunities, music programs, after-school arts and educational programs, job training, activities for older adults, anti-human trafficking programs, spiritual development, and drug rehabilitation. The Salvation Army continually strives to be a beacon of hope for thousands of individuals and families throughout Greater Philadelphia- enriching and transforming lives of those in the greatest of need. 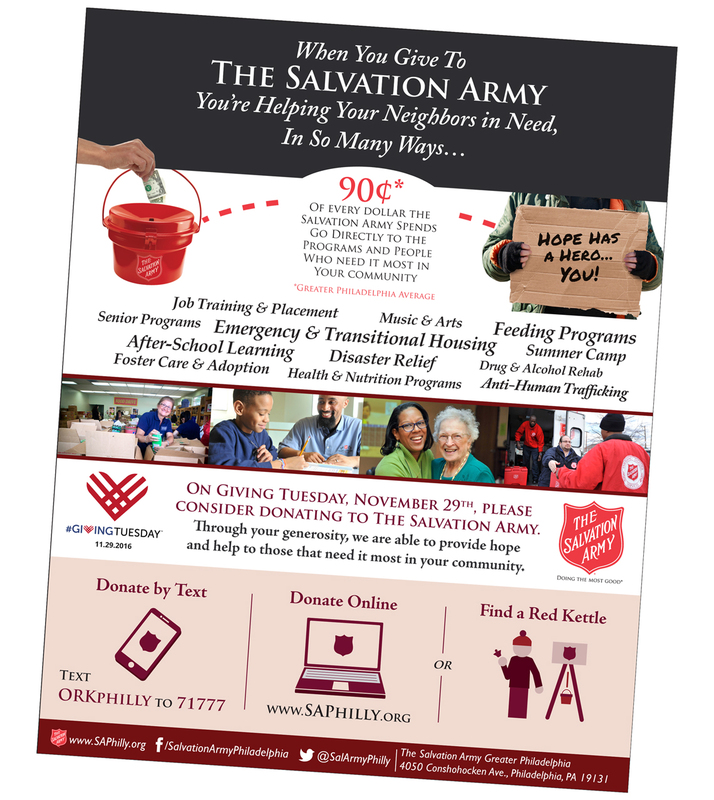 LEARN MORE about THE SALVATION ARMY GREATER PHILADELPHIA . . .